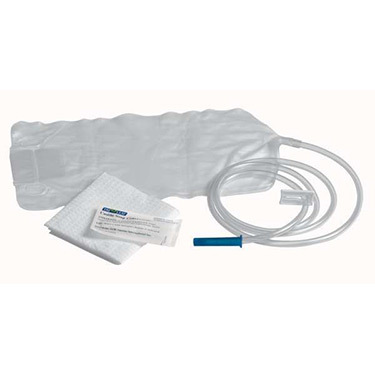 Disposable enema bag set: Designed with a spill proof valve on the 1500cc enema bag and easy-use funnel top. 54 soft vinyl tube has a pre-lubricated, smooth, non-traumatic tip with rounded eyes for safety and easy insertion. This enema kit also contains a moisture-proof castile enema soap packet and a plastic shut-off clamp. Each enema bag kit with slide clamp and pre-lubricated tube is individually boxed within the case,. Overall these bags work well. They're pretty easy to fill, and you can see the flow rate through the clear plastic. The slide clamp is difficult to operate. In case of patient discomfort, it's difficult to stop the flow with one hand.